The owners of this charming North London townhouse had lived in it for 10 years and had decided to rethink the spaces that didn’t work for them. The house has a lovely large kitchen which opens out onto a generous garden, and the owner’s spend all their time there in the summer, only retreating to the other reception rooms in the winter. The double reception was cold, felt un-lived in and lacked suitable storage. We focused on winter essentials – comfort and warmth. 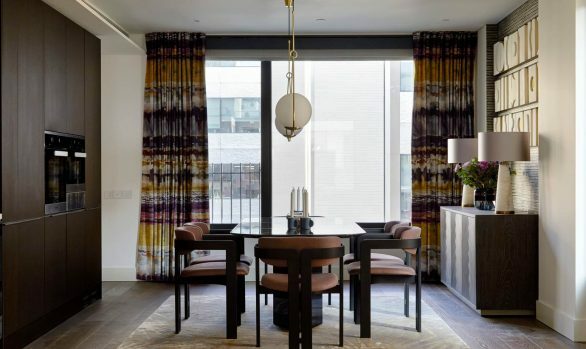 To make the rooms in this Highbury Interior Design project feel like more of a retreat, bespoke storage units allow clutter to be easily stashed away, and the eco fire creates not only an inviting focal point but throws heat and warm light into the far reaches of room. 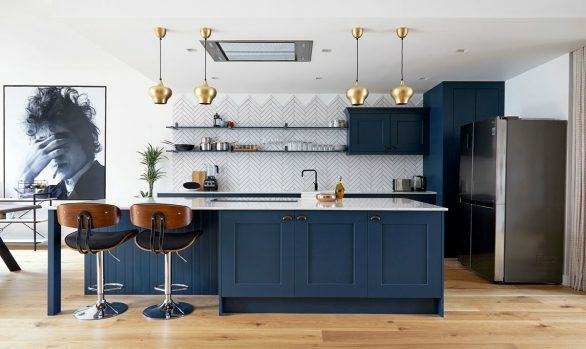 The bold, navy walls intensifies the yellow light from the fire, but is softened by the clean, pale grey tones of the painted shutters and cabinetry. These colours are offset with hints of gold, copper and bronze which add depth and continuity to the design. The heated window seat has storage designed for the client’s yoga mats, so that they are always pre-warmed for her in the mornings. Adding a combination of layers and textures to the room adds comfort, absorbs sound and reflects warmth. It also adds aesthetic layers that make the room interesting, and makes it easier to integrate other items into the design at later stages. 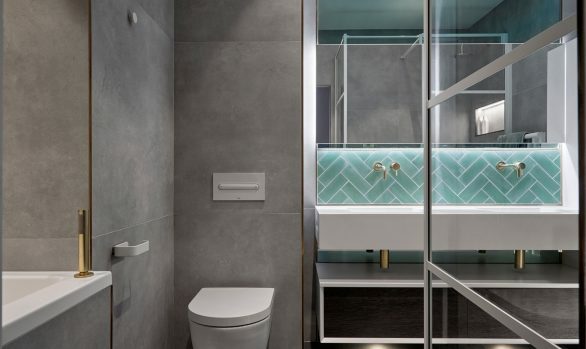 Storage was also a key concern in one of the bedrooms in this Highbury Interior Design, as well as making full use of the space. The room was bathed in light from super high ceilings. A bespoke blind system was used to give adequate privacy and shade from the sun. There was already an unmoveable plinth on the floor, so we decided to make a feature of it and build up around it to house drawers and clothes storage. Likewise, on the wall was a crooked chimney breast, also unmovable, which we boxed in and clad with beautiful warm wood. Around it are touch-open storage compartments, lined in a bright and warm yellow, hints of which are visible through all joins and hinges. If you are looking for gorgeous interiors, Kia Designs is where your search stops. With years of experience in interior designing, we have come to know the best way to impress our clients. Our London design solutions cater to several districts in the city. 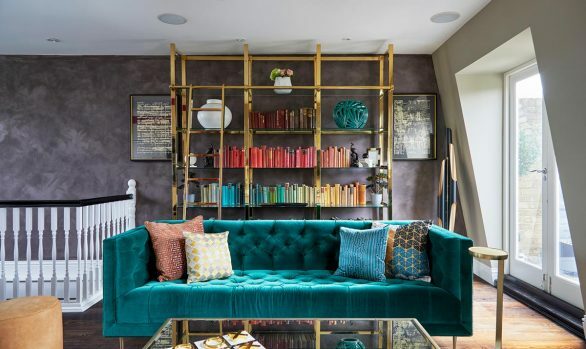 The Highbury Fields interior design service is one of them. 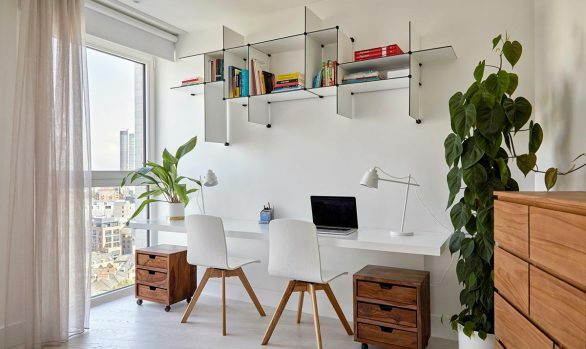 Whether you want to decorate your home in a trendy way or refurbish your home office decor for a more comfortable working atmosphere, we can help you with the most eye-catching, affordable and the smartest solutions. Over the years, we have gained rich specialisation in working on residential projects. A look at our portfolio will give you a complete insight into our creative instinct, capabilities and our range of ideas. 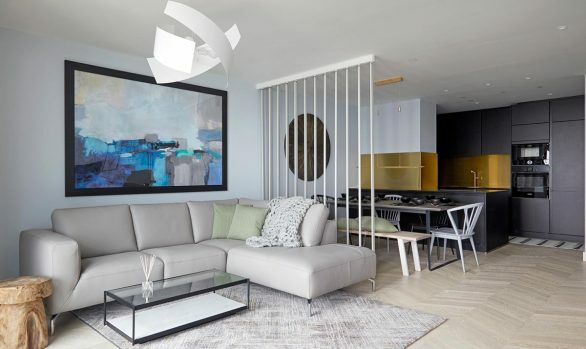 Besides effective consultancy services, we offer a range of other design related services, such as creating mood boards, giving you a tentative quote, estimating the cost of new furniture (if needed) and more. If you hire us, you can rest assured of the quality of the final result. With efficient workmanship and dedication to work, we can make your dream home come true.